Caution: This article was written on behalf of Squad No. 2 for IPS 64RR batch book. The context of this article is known only to 64RR. Apologies for unexplained jargons. Sometimes, memories of lifetime can be ruined if put to words. 320 days that we spent in NPA are undoubtedly the finest days our life. No matter how hard you try, it is very difficult to reflect those experiences in words. Nevertheless, it is worth attempting. Once the years pass by, it is only the words which can invoke the feeling of reliving those finest moments of our life! We all came from different backgrounds, different cultures and very different perspectives. 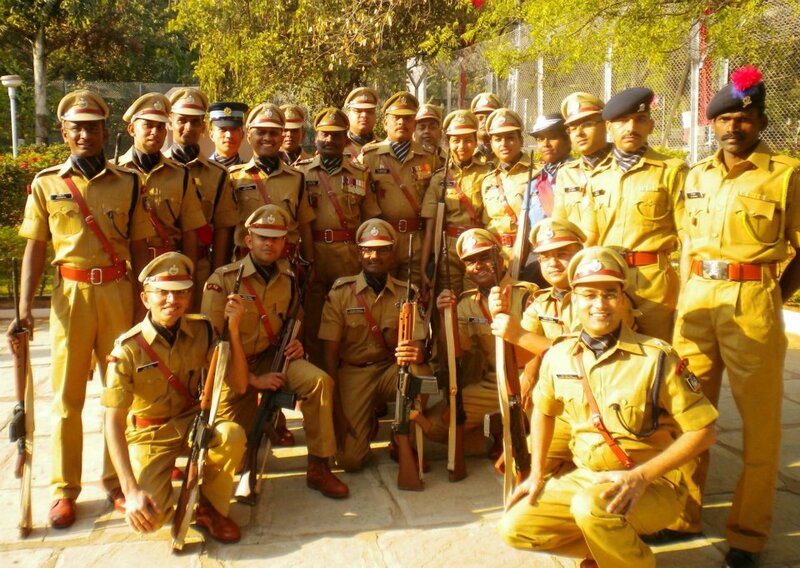 Two officers from Nepal and Maldives made this group even more diverse. Ustads made this group complete. Laxman Oran sir treated us like his own kids. Though he was there with us for short period, his association with the squad left a lasting impression. Abdul Samad sir carried the baton of leading the squad with the same spirit and energy. Both of them just loved talking to us. So much so that we named Abdul Samad sir as “Gyani” ustad! Lekhraj sir was a hard task master, a KTP (Mugambo) ustad, never shown mercy on us. But it was his “strictness” which taught us quite a bit (remember “Mugambo khush huwa!?”). Subhash ustad (aka Tiger ustad) was ever ready to help us under any odd circumstances, Bhanwarlal sir played a similar role. Coming of Mohanty sir was a late but welcome addition to the squad. Ustads were the one who held our hand and took us from the first day to the passing out parade. The love and compassion that the Ustads shown made us feel at home. As long as we don the uniform, memories of the Ustads will be very fresh in our hearts and minds. Squad 2 was an interesting mix of OTs. Pratit Rowdy Rathore from Nepal, really impressed all of us with his stamping of the foot! So hard was the stamping that, for a moment we would think he can break the ground! He was a “Bindaas” type guy who slept all through the classes, and kept chewing something when he was awake! A straightforward guy who never afraid of speaking his mind. There was an interesting trio in Squad 2. Ajay Kumar “Mitra”, Chandan and Anand Mishra. Ajay, the founding father of philosophy of “Mitra”, had no dearth of energy and spirit. His 400m relay run without shoes and with blood on both his knees showed his team spirit and made him Paan Singh Tomar of 64RR. Initially, we thought Chandan was a serious guy. Phew! His witty jokes never failed to put a smile on our face. Mind you, deep inside, this guy has tremendous maturity, he is a guy who wants to give it a shot, whatever it is. Anand, a guy who really takes pride in being in the uniformed service. His UAC performance on 15th August stunned many. A gentleman at heart, ever ready to do anything for the team. There was one guy, though he was physically present in squad 2, at times, his heart was in squad 6! Thanks to Saxena sir’s classes, we all could find a name to Abhishek! (Remember “Jorba, what are you doing?”). Jorba was a pleasant guy to be around, clean at heart and has child like enthusiasm. Equally interesting character was Surya Pratap Yadav (or Singh?). Surya had no idea what the word confusion means. His favourite pastime is just “to pass time”! He is the only guy in 64RR who doesn’t sweat even after running 10kms. The word “Simple” is the first name of Karthick. Baggage of this prefix came from LBSNAA. Be it law, a game plan or anything, he prefered to keep things simple. His hindi tirelessly brought smile on our faces. His “never give up” spirit is something which can inspire the confidence of many. Despite his knee injuries, he played many games for the squad. So much so that he never stopped playing until he lost control over his knee. He fell down many times, but every time he fell down, he got up again for the team, something that truly inspired us. Yet another determined fellow was Sameer Cycle Sharma. Sameera would have fetched many medals for our squad if he wasn’t injured. A true sportsman with true spirit. We really missed him towards the end, wish he did POP with us. Battula Gangadhar and Rakesh Kalasagar were twins of squad 2. They were buddies and sticked around together. Gangadhar was known for getting up from the deep sleep and asking questions to the faculty. He would go back to sleep soon after his question was answered. He is the focussed guy who exactly knows what he wants in his life and gives his best to get it. Rakesh was calm, composed and sincere at heart. Somewhere deep down, he is a thorough gentleman. Manoj C was a different guy who always seemed to be lost in his own world. A silent and cool guy who cheered squad 2 in most of the games. Manoj will remember Rambo for rest of his life for what accidentally happened in hockey ground! There is an interesting trivia attached to our squad. We had four lady OTs, more than any other squad had. Usha was sincere and intelligent almost to an extent of being KTP! Her simulation reports are testimony to this. Be it indoors or outdoors, she always gave her best. Swapna was calm, composed, soft spoken and was the torchbearer of our squad in most of the cultural activities, but hated anything adventurous! Rahuma brought a unique Maldivian flavour to the squad. Smile was her most important medium of expression. She is the fighter, a brave lady who never gives up. Running 400m and 100m sprint with injured knee was something which inspired many. Ever ready to participate in the games, the lady who loved outdoors and games. Amrutha was a late but welcome addition to the squad. A good singer, articulate, knows exactly what she is doing and does what she think is right and does it with utmost clarity and precision. A good sportswoman who fetched the first medal for squad 2 in the athletic meet. Hitesh - our own Rambo - had no dearth of energy and spirit. Caring and compassionate guy who is ever ready to do anything for the team. Thanks to “The Chief”, he finally graduated in what he got started here in NPA. Swapnil - The Chief - was a thorough gentleman, a balanced and matured guy. He was the one who made Manju the drummer, taught Rambo “something” and helped him graduate in that. Thanks to him, officers club came alive in NPA and not only that, he kept the spirit of officers club going! Gaurav Garg aka GG, always thought two steps ahead of anyone. He is one guy who can touch deep down the mind of someone in no time. GG was the powerhouse of squad 2. In the very first day of our UAC class, he tore apart the punching bag. He was a friend, philosopher and guide of squad 2. Squad 2 suffered a lot in games and athletic meet due to his freak injury. “Patilanchi Krupa”, was something Manju always said whenever squad 2 won a game.Thanks to Vinayak Patil, squad 2 could fetch a silver in handball. He was one of the best sportsman of the squad, great athlete, a team man and a balanced guy. Basic training at NPA was a unique experience. No one was exceptional in the squad but we as a team had loads energy and synergy to excel. Injuries let us down, but not our spirit. We fought back, we never gave up and we made every moment of our life here memorable. The best days of our life so far may have come to an end, but the memories of those days will remain fresh for a long time to come. PS: Special thanks to Swapnil for the inputs!